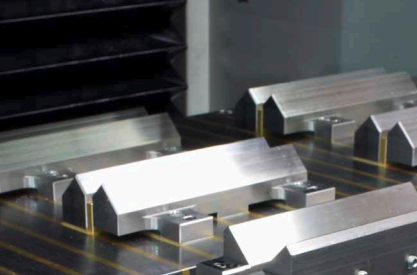 The KPSM moves the machine table in the X direction.With the help of our patented clamping device we are able to grin longitudinal profiles (cross-section up to 70 x 70 mm). This new innovation can grind two sides at right angles within one working cycle. 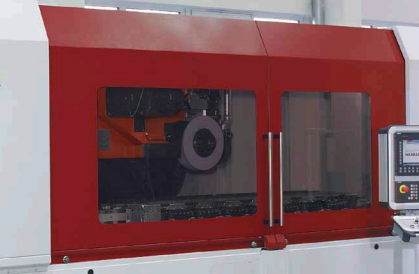 Depending on the equipment, it offers the possibility of flatgrinding and profilegrinding up to 600 mm width. 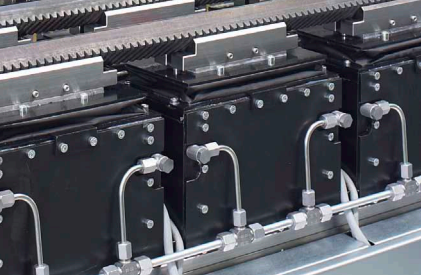 Standard features includes full encapsulation, direct measuring of the axes Y + Z, V and W, Coolant Fine Filter and anti-vibration mounting elements. The machine bed of the KPSM is a ribbed welded construction. The generously sized, high-precision linear guide ways of the axes X, Y and Z are centrally lubricated. A 840D sl Siemens control with Sinamics-drives in a conditioning cabinet is used. The user-friendly User Interface guarantees easy and comfortable machine operations. 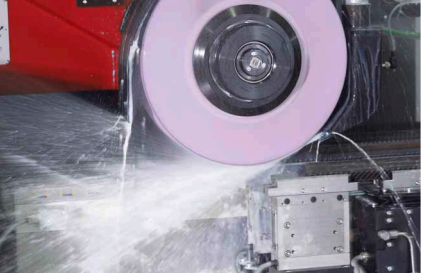 The grinding disk will be dressed during production with a 2-axis CNC controlled diamond wheel which enables a consistently high quality and less downtime. The contours are freely programmable. Fully automatic balancing system which recognizes and removes unbalances at a very early stage. 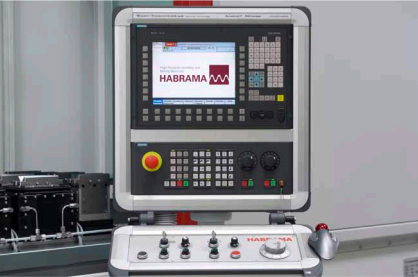 This guarantees a high quality of the workpiece surfaces and a long tool life of the spindle. Optional also with automatic door drive for comfortable and safe working. 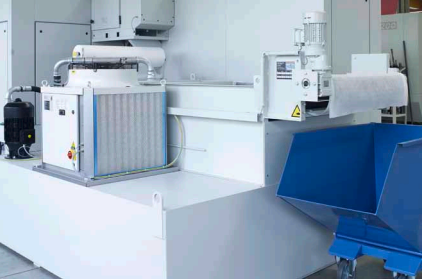 Coolant system with integrated fine filter system, optional with 16 kW cooling unit. 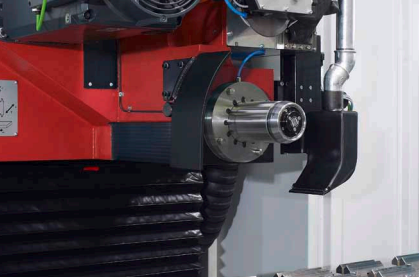 The cylindrical grinding spindle allows easy disc changing. Siemens 840D sl with Sinamicsdrives in an air-conditioned cabinet. Equipped for teleservice. Magnet will pull the working piece into ideal position and clamps it afterwards. 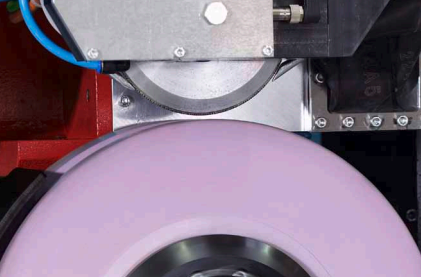 The nozzle compensates abrasion on the grinding disk automatically. The basic clamping device consist a magnetic plate. The additional prisms can be quickly installed and dismantled for small batches of racks. 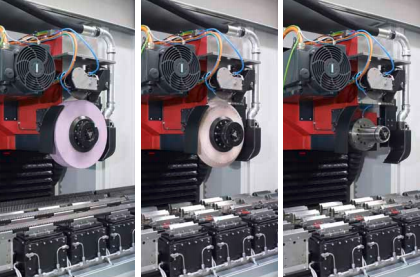 Without prisms, the machine can be used for flat grinding.